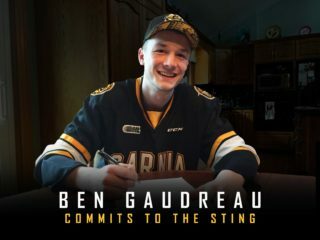 It was a week of twists and turns for the Sarnia Sting. With a combination of player acquisitions and edge-of-your-seat action, the Sting certainly made a few waves. Let’s take a look at what happened on the ice. 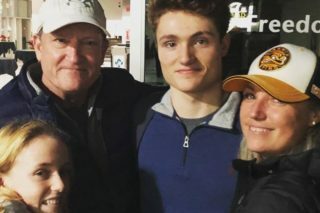 On Friday, the Sting were set to begin their weekend with a trip to play the Kitchener Rangers. However, it was postponed due to inclement weather. It has been rescheduled for Tuesday, February 27. Being left with what turned into a two-game homestand, the Sting went to work. On Saturday night, the Niagara IceDogs came to Progressive Auto Sales Arena for their lone visit of the regular season. The Sting at one point led 3-0, then ended up in a 4-4 game. In overtime, Sarnia emerged with a 5-4 victory. Cam Dineen scored the game-winner on a pinch down low. It was a thrilling contest. For Sting goaltender Justin Fazio, Saturday night was especially memorable. Fazio became the franchise’s all-time leader in single-season wins by a goaltender with 30. With tonight's victory, @JustinFazio97 has set the new franchise record of 30 goaltender wins in a single season! The entire Sting organization congratulations Fazio on this amazing accomplishment. It’s extra special given that Fazio is a born-and-raised Sarnia native. On Sunday afternoon, the Sudbury Wolves visited The Hive. Again, the Sting ran into a bit of trouble, being down 4-1 during the first period. However, the Sting rallied for a strong 5-4 regulation time win. Sting defenceman Connor Schlichting led the way as first star of the game. Schlichting had a goal and two assists. Jonathan Ang also matched with a goal and two assists of his own. With the weekend’s games complete, the Sting have wrapped up their regular season matchups with the Eastern conference. It’ll be all about Western playoff positioning as we head down the stretch. The Sting made headlines across the league this week when they signed defenceman Mitch Eliot. Eliot, a 1998 birth-year, joins the organization after almost two seasons at Michigan State University. Prior to playing with the Spartans, Eliot played for the Muskegon Lumberjacks of the USHL. Eliot also captained the United States in the 2016 Ivan Hlinka U-18 tournament. Fazio leads the OHL with a .920 save percentage; Kyrou co-leads the league in assists with 56; Ruzicka co-leads with eight game-winning goals. The Sting look ahead to a trio of division rivalry games this week. Included are two matchups against the always tough Saginaw Spirit, and one massive game against the league-leading Sault Ste. Marie Greyhounds. On Friday night, the Sting begin the weekend with a road trip down to Saginaw. The Spirit are sitting sixth in the Eastern conference. Spirit defenceman Marcus Crawford leads the team in points this season. Their captain, veteran defenceman Keaton Middleton, provides an always imposing presence on the back end. On Saturday, it’s our fifth meeting of the season with the Hounds. It’s been an even split so far this year. The Sting are 2-1-1 against the Canadian Hockey League’s number one ranked team. Expect a packed Essar Centre for this one. And on Family Day Monday, we’ll see the Spirit right back here at Progressive Auto Sales Arena. Bring on the whole family down to The Hive for some holiday hockey!